GSA Buchhalter Guide - The GSA Buchhalter is a software for all self-employed persons and small companies who do not need a double entry bookkeeping. Monkey Merge Guide - Automatically merge multiple Microsoft Word documents, Excel spreadsheets, Adobe PDF files and all plain text files such as CSV files. GSA Auto SoftSubmit Guide - A program designed to submit software to hundreds of web sites. Basic Bookkeeping Guide -It is a very easy-to-use accounting system that is specifically designed for small and home based businesses. 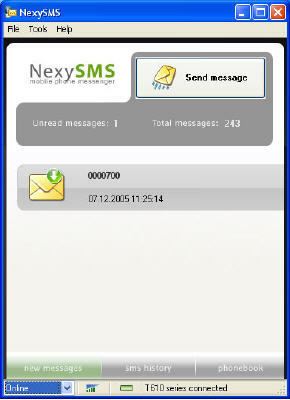 NexySMS Guide - A mobile phone messenger which allows you to send and receive SMS with your phone. GST-VAT Accounting Guide - It is an easy-to-use accounting system designed specifically, for use by small and home based businesses that need to track collection and payment of Goods and Services Taxes (GST) or Value Added Taxes (VAT). Bookkeeping for REALTORS Guide - It is a new version of our best selling Basic Bookkeeping that has been designed in consultation with REALTORS for REALTORS. Simple Business Accounting Guide -Designed for business owners, not accountants, OWL Simple Business Accounting (SBA) makes bookkeeping quick, easy and affordable. Unlike double entry systems, SBA's single entry method is intuitive. Master Investor Guide -Investment Management and analysis software for individuals and professional money managers.It is a fully integrated system that combines portfolio management with technical analysis. Simple Business Invoicing & Inventory Guide -Designed for business owners, not accountants, OWL Simple Business Accounting (SBA) makes bookkeeping quick, easy and affordable. Unlike double entry systems, SBA's single entry method is intuitive. YukonDev SQL Editor Guide - A lightweight but powerful tool for management, development, tuning up, deployment and data manipulation to use by Microsoft® SQL Server DBA and database developers. 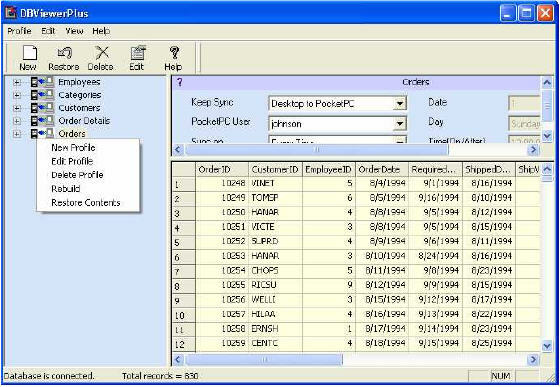 Pocket Database Viewer Plus(Access,Excel,Oracle) Guide - View & Synchronize Microsoft Access, Excel, Oracle, Foxpro, dBase or any ODBC enabled database with Pocket PC. 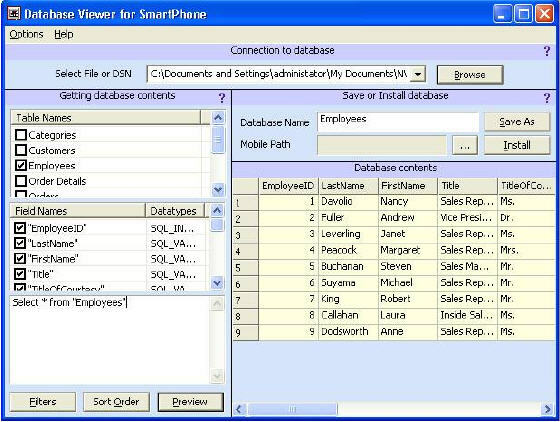 Smart Database Viewer(Access,Excel,Oracle) Guide - View any database on Windows Mobile-based Smart Phone 2002 or higher. 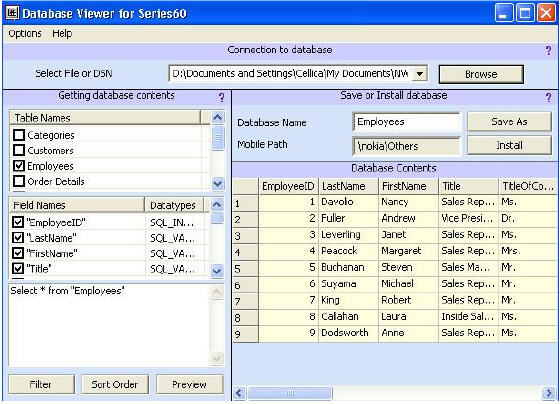 Mobile Database Viewer(Access,Excel,Oracle) Guide - View the contents of your desktop databases like MS Access, FoxPro, dBase, Excel and any ODBC Compliant Database like Oracle, SQL Server on Mobile phone. 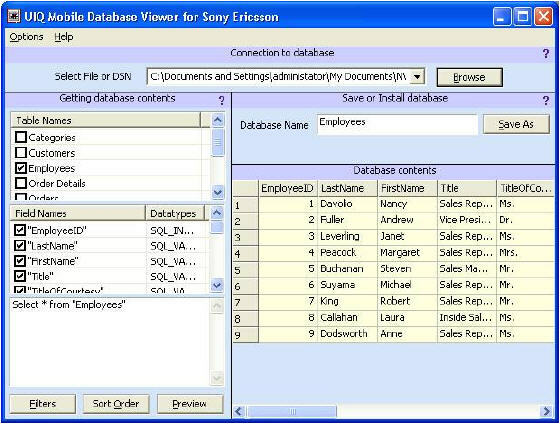 Mobile Database Viewer(Access,xls,Oracle) Guide - Convert your MS Access, FoxPro, dBase, Excel, MySQL or any ODBC enabled database to PDB, and then you can view it on Sony Ericsson Mobile device. 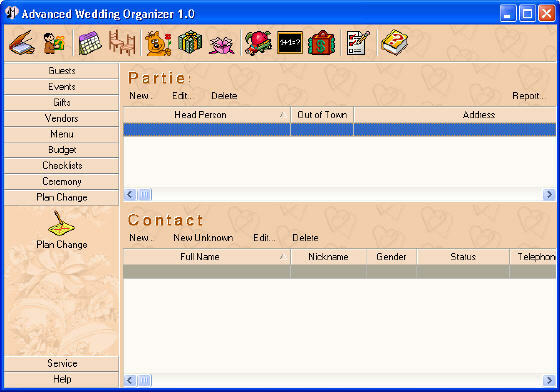 Advanced Wedding Organizer Guide - Manage all information concerning your coming wedding, simplify your wedding preparation process. 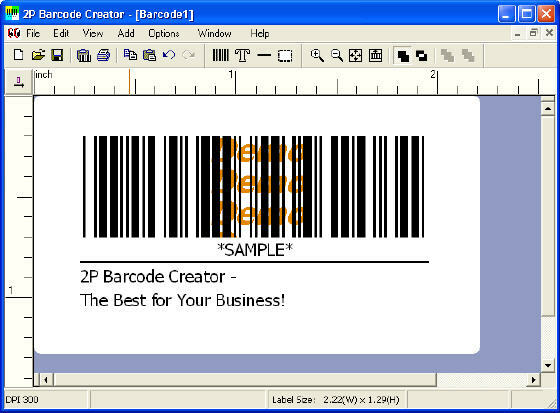 2P Barcode Creator Guide - A very powerful yet very easy-to-use barcode creator program which allows you to create barcode images in three basic ways. 2P Label Designer Guide - A powerful yet very easy-to-use professional Barcode Label Design software specifically for predefined off-the-shelf labels. 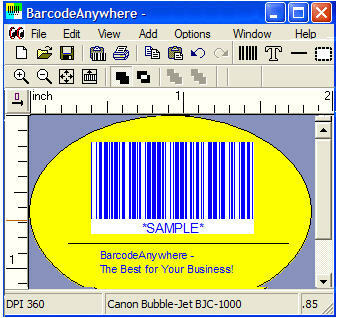 BarcodeAnywhere Guide - A very powerful yet very easy-to-use barcode creator software which allows you to create barcode images in three basic ways. Personal Portfolio Manager Guide - PPM was rated the best portfolio management software by the Financial Times (London) and Securities Research Company Ltd (New Zealand). WorshipCenter Pro Guide - A worship presentation software package specifically engineered for church services - Create slides for song lyrics and display slides with professional transitions and effects. Project Budget Manager Guide -It is a cost control program for projects with budgets as small as $500 and as large as $5,000,000 or larger. Developed for engineers rather than accountants, Project Budget Manager emphasizes control of project costs in preference to accounting for them after the fact. Classic Menu for Excel Guide -Could not see the menus in the last version of Excel? Just download and install this software, you will see and enjoy classic menus and toolbars of Excel 2007, as in the Excel 2003/XP. Classic Menu for Office Guide -Just download and install the software, you will see and enjoy the Main Menu Bar, Standard Toolbar and Formatting Toolbar again in Microsoft Office 2007 immediately, as in Office 2003. Classic Menu for PowerPoint Guide -Could not see the menus in the last version of PowerPoint? Just downloadMicrosoft Office Marketplace logo and install this software, you will see and enjoy classic menus and toolbars of PowerPoint 2007, as in the PowerPoint 2003/XP. Classic Menu for Word Guide -Could not see the menus in the last version of Word? Just downloadMicrosoft Office Marketplace logo and install this software, you will see and enjoy classic menus and toolbars of Word 2007, as in the Word 2003/XP. HanWJ Chinese Smart Editor Guide - Help you learn, edit, speak, teach Chinese. 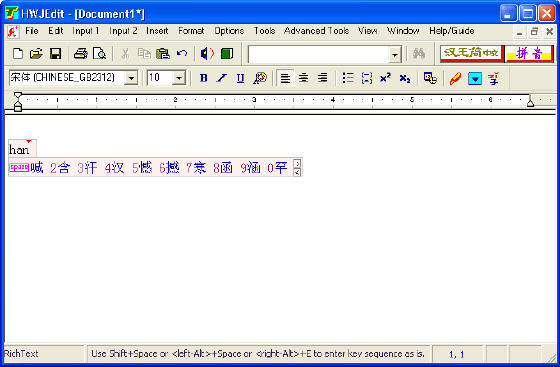 And it has a powerful feature of converting between Simplified and Traditional Chinese. HanWJ Chinese Input Engine Guide - Provide a Chinese input platform for various Windows systems which enables you to type Chinese on general application software, e.g., Microsoft Word, Internet Explorer, Messenger, etc. AutoSoft Online Standard Edition Guide - AutoSoft Online is a new Automotive Software and Computer System specifically designed for the administration of Auto Repair Shops. FTrack CRM Enterprise Suite Guide - FTrack CRM is a multilingual, Small Business Customer Relationship Management System (CRM) application developed for platforms that supports Java 2.
dbAssist XP Guide - dbAssist XP is a professional but easy to use utility for managing and administering all of your xBASE (.DBF) database files. Depreciation 4562 Pro Guide - Depreciation 4562 Pro is a complete fixed asset system which includes book and tax depreciation, management reporting, and asset tracking. Chat line express Guide - Chat line express is a super semi auto form filler. It can input messages, sentences, articles etc. It helps you organize your bits of info into the intuitive Explorer-like form. EssentialPIM Pro Desktop Edition Guide - This personal information manager can store, manage and encrypt data: day/week/month/year schedules, notes (pictures, any formatted text), and contacts. Car Expense Tracker Guide - Car Expense Tracker, is an easy to use, full featured application, that will allow you to keep track of all aspects of your car/vehicle/boat/etc. Diagram Studio Guide - Diagram Studio is a powerful application for creating professional-looking business, technical drawings and illustrations for your documents quickly and easily. PicturesToExe Guide - All you have to do is choose some pictures (in JPG, GIF or BMP format). 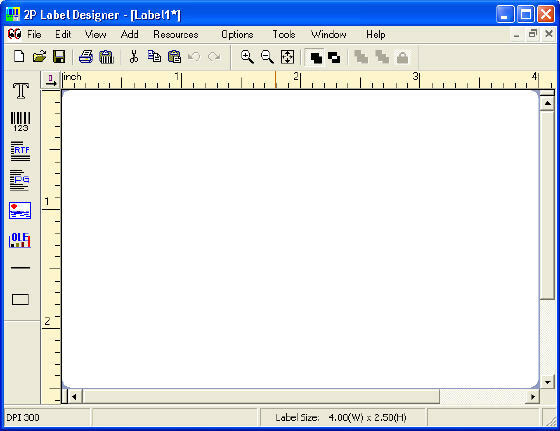 PicturesToExe will produce single EXE file, which contains all images inside. Finance and Statistics Models Set Guide - It contains different topics in finance and statistics from simple model such as computing standard deviation and mean to more advanced models. Random Numbers Generator and Statistics Set Guide - Provides 12 random numbers generators that allow you to generate histogram from the probability distribution given the parameters you have specified. advDigester Guide - AdvDigester is assistant office software that helps you to extract the particular parts from your Microsoft Word documents and create a new one from these extracted parts. AnyForm Guide - Fill up paper forms with data. The original form will be scanned and displayed. The user can define fields on the form with different attributes as data type, font, position etc. PDF Split Merge Pages Guide - It is a file utility to extract pages from pdf files, split pdf files into multiple parts, merge pdf pages into one pdf file, merge pdf files and extract images from pdf files. PDFSearcher Guide - Pdfsearcher finds PDF files, searches zip archives for pdf files, converts pdf to text, locates text view files, displays search strings, and matches text. Advanced Time Reports Palm Guide - Time tracking and project management software for palm devices that can synchronize with ATR Personal or ATR Professional easily. Multi Project Planner Guide - It's wonderful project management software that helps you manage your project, allocate tasks to your employee efficiently. PDF Filler Pilot Guide - Fill out form, enter any text or graphic in all popular electronic forms including PDF, DOC, XLS, TXT and so on. SpeQ Mathematics Guide - A small, extensive mathematics program that can handle all kinds of scientific calculations, define variables and functions, and plot graphs of your functions. Excel Invoice Manager Express Guide - It Helps you handle all small or home businesses invoicing needs, manage your customers, products, invoices and payments. WhiteSmoke Enrichment Guide - A writing assistant solution that helps you write better on all applications including Email, Word, HTML, Messenger, etc. 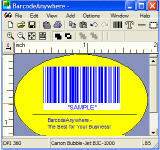 Bar Code 128 Guide - A truetype and postscript barcode font set adds the ability to print barcodes to virtually any Windows program. bcTester Barcode Reading and Testing Guide - Read, view or edit linear and 2 dimensional barcode on digital images captured by scanning or photographing. Currency Converter FX Guide - Easily get the latest currency exchange rates of more than 150 currencies and convert currencies. DataMatrix ActiveX Guide - Make professional quality bar codes and add them to Web pages, database reporting and labeling, product packaging, document tracking, postal bar coding etc. DB for Outlook Guide - It can provides MS Excel and MS Outlook users to execute functionality at ease. You can create Excel Input Database, Excel Output Database and E-Mail from the Output Database.